A new Chinese restaurant has landed in the city. Traditional Chinese fare, Dragon Chef style. Click for more. (SPOT.ph) In the Philippines, there are certain requirements we look for in a Chinese restaurant: an appropriate selection of dim sum, noodles (crispy, steamed, in broth), fried rice, mango with sago. With the number of Chinese restaurants in the city, owners are hard-pressed to look for something that will make them stand out. 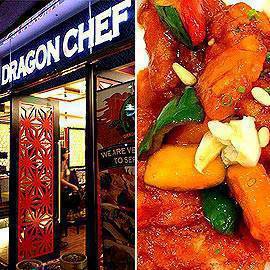 While some opt for homestyle cooking, elegance and sophistication, or even fastfood, Dragon Chef at Trinoma is neither. Helmed by restaurateur Ricky Laudico (Marciano’s, SumoSam, etc.) and Chef Florabel Co-Yatco (Crisostomo, Elias, Florings, etc. 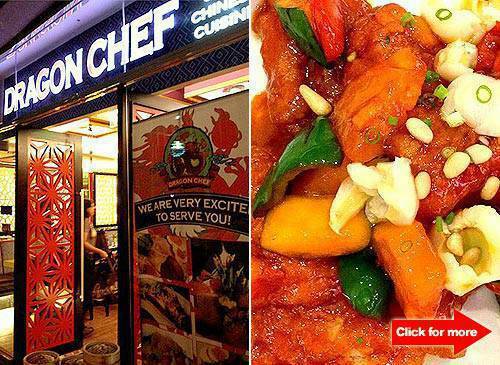 ), Dragon Chef is a culmination of years of experience in the business. Only the latest of the pair’s many undertakings together, it has that unflappable combination of good food, great ambience, and the playing up of proverbial favorites. An example of the latter is Dragon Chef’s Green Tea with Lychee and Red Citrus iced teas which echo SumoSam’s famous Red (grenadine) and Green (lime) Iced Tea, right down to the floating bits of pomelo. With your choice of beverage in order, whet your appetite with the Quarry Bay (P158), tender pork siomai topped with edamame for an suave layer of softness. The Har Gao (P148), more commonly known as hakao, is also favorable, a peppery bundle of succulent fresh shrimps. Visually, the Mixed Seafood Noodles (P328) is far from the glowing, layered vision of noodles, vegetables, and goodies we normally see. Still, we do take the time to appreciate the slightly salty and savory dish. Other dishes to try are the Sweet and Sour Fish with Lychee (P308) and the Manchurian Calamari (P288), both surprisingly crisp on the outside yet soft and juicy inside. Offset its strong flavors with the Dragon Chef Fried Rice (P298). Two stunning pairings also caught our eye and tastebuds. The WanChai Pork Asado and Lechon Macau (P318) is a complementing plate of the full-bodied asado and the subtler lechon. Meanwhile, the Yuen Long Pork with mantau rolls (P458) is a neat balance of fluffy bread and toothsome meat that’s so beautifully braised it pulls apart easily. To cap your meal, try some Snowballs (P328), coconut-dusted lo mai chi with various fillings inside. At the center of the dish is an adorable bunny-shaped Snowball seemingly hiding in a garden of rice cakes. This sweet surprise is an appropriately sweet ending to the Chinese feast. Stepping inside Dragon Chef feels like entering the set of Once Upon A Time in China. Predictably, the interiors are red with gold and black accents. The space is modest, but the integration of various textures (velour seats, leather-lined Chinese screens), as well as the pop art paintings on the ceiling, gives it a luxe-almost Shanghai-esque-charm. But don’t expect Jet Li to come knocking over tables with a spinning high kick. Here, it’s only good Chinese food and lots of it.